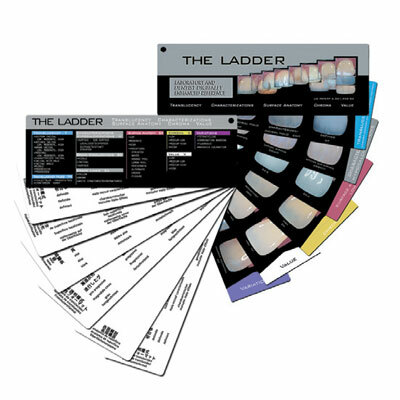 THE LADDER is a reference guide created for dentist-to-ceramist communication of tooth features. Featuring a pictorial display of digital images on laminated archival photographic paper that allow for multiple reproduction of identical references, these images are categorized, color-coded by category, and encoded for reference and communication. With THE LADDER, clinicians won't be subject to inaccurate color photos, written descriptions, schematic drawings, or the additional costs associated with photography. THE LADDER standardizes features of tooth appearance in a comprehensive and user-friendly format so that restorations can be accurately fabricated for the satisfaction of all patients, essentially eliminating the need for esthetic re-makes.